Hamburg - Bundesliga strugglers Hamburger SV have more than just a first three points of the campaign as an incentive to beat reigning champions Borussia Dortmund on Saturday (kick-off 15:30). Victory would put an end to BVB's 31-match unbeaten streak - just five short of the Bundesliga Dinos' own 36-game record set between 1982 and 1983. While HSV have lost all of their competitive encounters this term, including a DFB Cup first round tie against third-tier Karlsruher SC, Dortmund have picked up where they left off last season. Seven points from a possible nine in the league is a positive start, while their 1-0 win against AFC Ajax in the UEFA Champions League will only have further boosted their self-confidence. 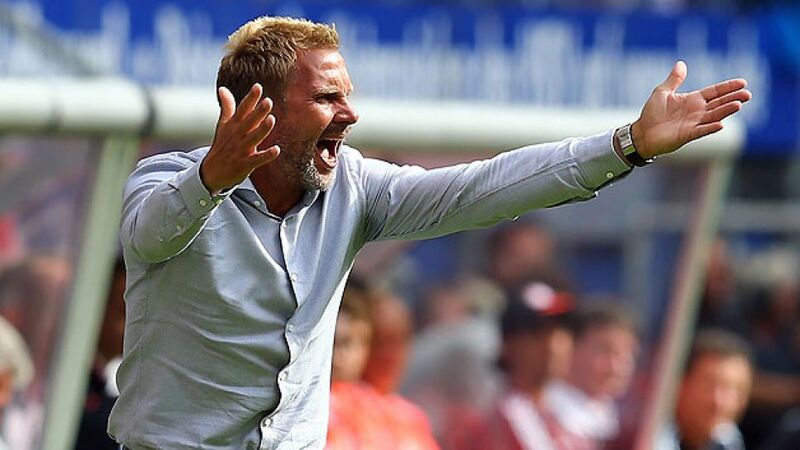 Ahead of the fixture Hamburg head coach Thorsten Fink, a Dortmund native, has decided to embrace his side's role as underdogs. "We've got nothing to lose, which can liberate the mind," said the 44-year-old, whose sentiments were echoed by defender Heiko Westermann: "We're the clear outsiders. Still, we want to give it our best." Saturday's hosts have only scored twice so far this season, both goals coming in last weekend's 3-2 defeat against Eintracht Frankfurt as Rafael van der Vaart made a significant impact on his debut. "We proved that we can play well going forward," said coach Fink on the performance. The Red Shorts boss will be without the suspended Petr Jiracek, while Marcel Jansen may be forced to play at left-back in an attempt to shore up the backline. Jeffrey Bruma was unable to train during the week due to a knee problem and will undergo a late fitness test. Borussia Dortmund, meanwhile, are facing a few injury concerns of their own. While Ilkay Gündogan failed to make the trip due to a viral infection, goalkeeper Roman Weidenfeller looks to have overcome a similar problem. One man who could single-handedly equal Hamburg's record of 36 unbeaten is captain Sebastian Kehl, who hasn't lost any of the last 35 matches in which he's featured for Dortmund. Nonetheless, coach Jürgen Klopp is aware that rotation is going to play a key role within the intense schedule his side face in the coming weeks: "When we're playing mid-week fixtures we'll look all the players in the eyes to determine who will start." Klopp's charges covered over 120 kilometres of distance during their Champions League tie with Ajax, a season best for the titleholders, and their unrelenting style of play isn't about to drop in intensity against Hamburg. "Spread over a full 90 minutes and eleven players that's not that much," stated Klopp, who recognises the extra quality HSV have added to their game during the summer transfer window: "Hamburg's style of play has changed with van der Vaart in the side," he said. "They're going to throw everything at us."